I have been working with minerals well over a decade. My initial interest was in healing properties of clays, which I later expanded into salts, healing mud, zeolite and diatomaceous earth. I started writing about minerals approximately at the same time, as I was learning about them. This resulted in me publishing 3 mineral healing books and writing 2 free reports. One book is in the process of being written – more about it later. 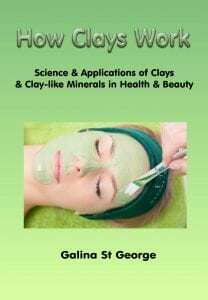 My first book in the Mineral Healing Books series was about clays and salt from a Russian salt lake. I never published it anywhere, but researching minerals in so much depth made me aware of how underused and undervalued they are by the general public. And the main reason I believed was the scarcity of information about them. So I decided to start writing about minerals. 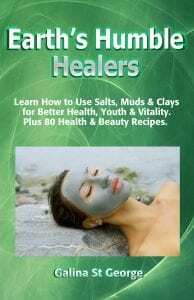 The first one in the Mineral Healing series, this book is exactly what it says in the title – an overview of healing benefits of salts, clays and other minerals. It is a much more detailed version of the “Mineral Healing” report and includes 80+ recipes to use at home – both to make yourself look and feel better. This book is both for professional people using minerals for health and anyone who wants to know more about health-giving properties of salts, muds, clays, zeolite and diatomaceous earth. 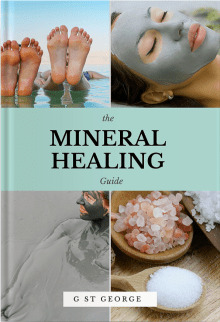 The book is the second addition to the Mineral Healing books series. It focuses mainly on scientific aspects of clay and clay-like minerals, their structure and reasons for why they have such potent healing properties. If you are as much of a bookworm as I am and want to learn why clays work, this is for you. If you use clay a lot and have been wondering why they work – it’s also for you. And if you treat your clients or patients with clay, you need to read this book for sure. The third one in the Mineral Healing series, this book is not meant to be an exhaustive study of magnesium. If you are into a detailed study of this wonderful mineral, I suggest you read the book by Dr Mark Sircus “Transdermal Magnesium Therapy”. My book aims to give a brief overview of the 25 most common health conditions which can be improved by using magnesium, especially transdermally. 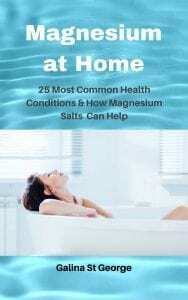 If you are just starting with magnesium and would like to learn the basics, this book is for you. It is also for you if you would like to help your clients and patients who suffer from those problems. You can read more about transdermal magnesium therapy in my blog posts. 1. “Mineral Healing – Salts, muds & clays – How they can be used for better health, youth and vitality” – this is a report you see in the widget area of this website (where it invites you to sign up to updates from us). This report gives an overview of most used minerals, their healing properties and how they can be used to help with various health problems. It is a mini-version of Earth’s Humble Healers. The aim of the report is to give an introduction into mineral healing, and if you want to learn more, much more information can be found in “Earth’s Humble Healers” e-book. This report is an overview of the way minerals can be used in situations where there are no medicines or medical facilities. It can happen when we are in the woods or any other places of wilderness. As an example, clay can and is being used as a natural filter and disinfectant for drinking water. And there are many more. Access the free report here. As you can see from the title, the book I am writing is all about toxins. It covers all kinds of toxins – from natural to man-made. 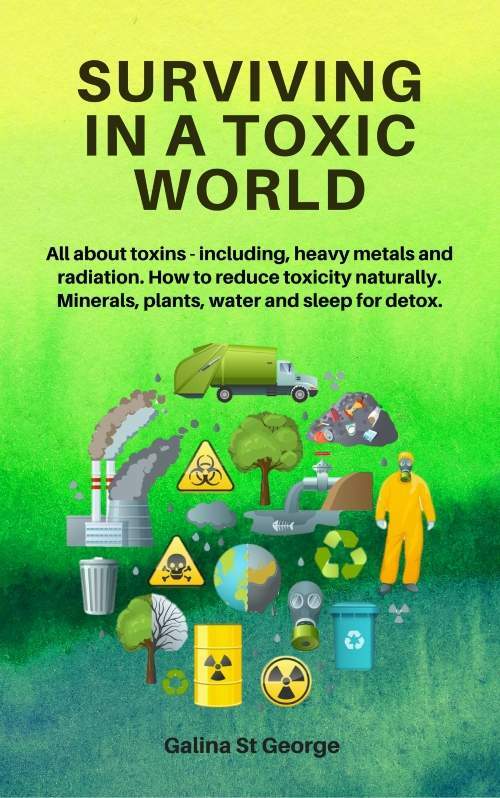 “Surviving in a Toxic World” covers not only a large number of toxins but also information about how to reduce toxicity naturally – by means of minerals and plants, as well as lifestyle and nutritional changes. It is going to be the most detailed book yet. The reason for it is that we are living in a time when the number and variety of toxins we are subjected to are growing fast. This creates the need to learn to not only minimise our exposure to toxins but to deal with the toxic environment we live in, as well as toxins in our body. Here is an article on how minerals can be used to protect us from heavy and radioactive metals. If you sign up for updates from me, you will be notified when the book is published. Read more about it here. I have developed mineral-based treatments and created courses to share my knowledge about how minerals can be used in natural health maintenance. The courses describe the treatments which can be done at home and in the clinic environment. To learn more and sign up to study the courses, visit courses.purenaturecures.com. I would like to say here that I am not a medical doctor, so am not qualified to give medical advice. Whatever action you take in regards to your health, make sure that you get a health clearance from your GP – especially if you have a medical condition. Clays, salts and other minerals are not medicines, and should not be used to replace medical treatment or medication.